For some people, "Sunday suppers" are big affairs...lots of boisterous family conversation, potluck dishes lining lace tablecloths in grandparents' houses, and old family recipes being prepared lovingly for the thousandth time. I admit I love the idea of a traditional Sunday dinner. But since there are only four of us in our house, and most of our relatives are a 5-hour plane ride away, I can't muster up the energy to make it a big thing. Instead I've come up with a new take on Sunday supper. I call it Sunday Supper Soup. I'm not talking about cracking open a can of Campbell's chicken noodle. I'm talking about a made-from-scratch, simmering-on-the-stove-for-hours, seasoning-and-tasting-until-it's-just-right kind of soup. There's just something about Sunday afternoons that inspires that kind of cooking; especially now that the weather has cooled down. Last Sunday, I was really excited to try out a recipe for Pasta e Fagioli that I found on The Foodinista's website. When I saw it was her father's recipe and required a lot of pureeing, seasoning, and tasting, I knew it would be perfect for Sunday Supper Soup. I did spend quite a bit of time laboring over this soup. It requires some TLC, not because the recipe is difficult but because there are a few different steps; it's not the kind of soup that just requires you to dump a bunch of stuff into a pot and bring it to a boil (although those can be great too). The thing is, the TLC pays off. This soup tastes rich and nourishing in a way that none of those "throw stuff in a pot" soups can. My husband actually declared it to be one of the best things I've ever made. And I've made a lot of great stuff, let me tell you. 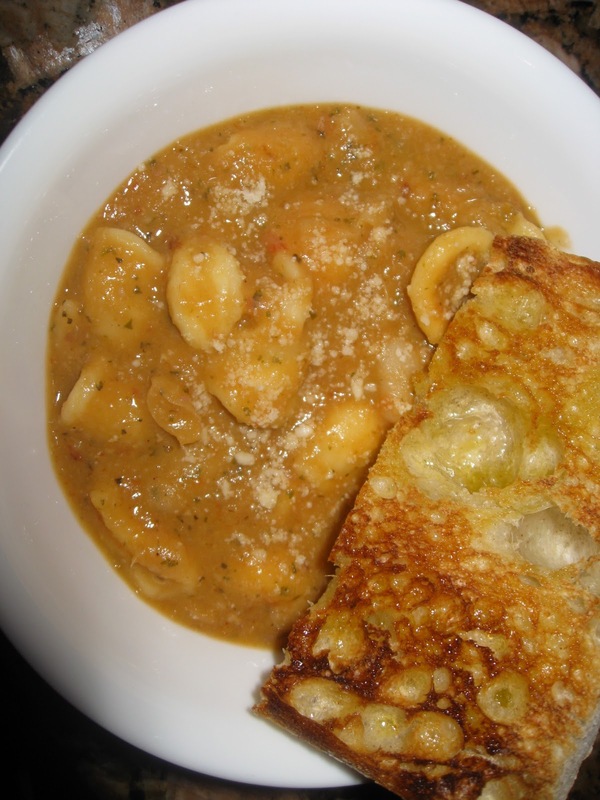 I've never made pasta e fagioli before, so I can't compare this recipe to any others. But I really can't imagine finding a better one. I do agree with The Foodinista that it can get a little thick, but adding a little more broth or water will fix that right up. And, of course, like any quality soup, this needs to be served alongside a big chunk of crusty bread. I love that this was a hit for your Sunday Supper Soup! A few things that can make a big difference—the brand of beans or pasta you use. The more artisanal type pastas I've found are heartier/starchier and require more broth to keep soup from getting too thick. Good to know! The only orecchiette I could find at Whole Foods was definitely of the artisanal variety. Next time I'll try out a different brand. And there will be a next time in my very near future! Looks yummy as always! :) I love making family tradtions that become special and unique to the family identity! !